It was a highlight of all of my trips to New York, because while I wanted to climb tall buildings, he didn’t. I had to force him up the World Trade Centre, and after practically begging for him to go up, it’s lucky we did because four weeks later it was decimated. I had a long distance relationship with a man in New York. We’d been together for a year when he moved there from London and every time I went to see him for the weekend on a Friday night, flying straight from work and landing late evening, he had never bought milk for my tea. Like a crack addict, I needed my tea so badly that I started bringing those little pots of milk from the plane with me. Every time his fridge was bare I would dig out my warm, acrid milk pot from my bag and peel back its tiny lid. 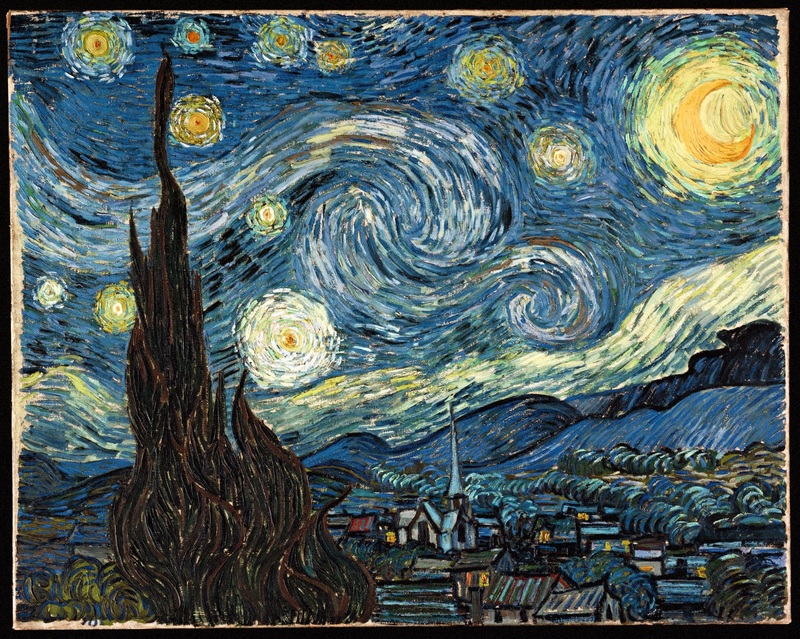 On this one particular trip I wanted to see The Starry Night by Vincent Van Gogh at the Museum of Modern Art (MoMA). Since the first time I saw it, those eternal, golden, swirling, unanswered, questioning spirals captivated me. I hung it on my teenage bedroom wall alongside fellow masterpieces Michael J Fox and Ralph Macchio. I went to see The Starry Night alone and I guess that’s the best way to see something that you love. Your emotions can run wild without fear of the person next to you ruining everything by saying “It’s very gaudy” or “Did you see a toilet on your way in?” It was a highlight of all of my trips to New York, because while I wanted to climb tall buildings, he didn’t. I had to force him up the World Trade Centre and, after practically begging him to go up, it’s lucky that we did because four weeks later it was decimated. When I arrived at London Heathrow late on that cold Sunday night I headed straight for the small supermarket to pick up milk for a cup of tea at home. As my eyes adjusted to the bright lights of the shop, I grabbed a basket and heard the opening bars to Don Mclean’s Vincent over the shop’s audio system. It’s the song with the opening line “Starry, starry night” and is written about the painter and painting I had visited that weekend. It was the closest thing to a cosmic hug I had ever had. He should have at least bought you milk, the universe seemed to say. At least. I have shared this silly ‘cosmic hug’ story for years, particularly when I’m raging bitterly about long distance relationships and wasted years. This song, not one that you hear very often, revisited me during a trip to London earlier this year. Now a mother of three beautiful children with a man who would visit every art gallery if we had the time, which now of course we don’t, I had a rare night away in a London hotel for a work reunion. It had been my first job in journalism and in London, and was the very essence of me before children, before New York, before anything. After checking in and billowing about unencumbered for a couple of hours in the room, I switched on my favourite radio show, one that I listen to every Saturday afternoon to feel like “me” again in amongst the chaos of family life. As I put my shoes on, a cover version of a song I recognised came on. Vincent. I immediately thought of my moment in the airport supermarket all those years ago. Just before I left my room a text message beeped my phone. It was from Sue, my old boss. “Dermot O’Leary is sitting in the pub where we are. Hurry!” The DJ who had played Vincent had just finished his show and was having a drink in the pub where I was headed. The universe suddenly felt very small. I missed Dermot, despite undignified running all the way to the pub, but that’s life. Two weeks later, my wonderful Auntie passed away. Standing in my kitchen, exactly a week after I knew she had passed away, I decided to switch on the radio to try to ease my broken heart. And I swear, in the instant I pressed the ‘on’ button and at once heard the first bar of the song, I knew I was going to be OK.
A beautiful story filled with passion and emotion……………………………………………..